The Zembula platform allows you to easily set up a direct integration that will populate your emails directly into a specified list in your Mailchimp account. The following instructions will guide you through the setup process. 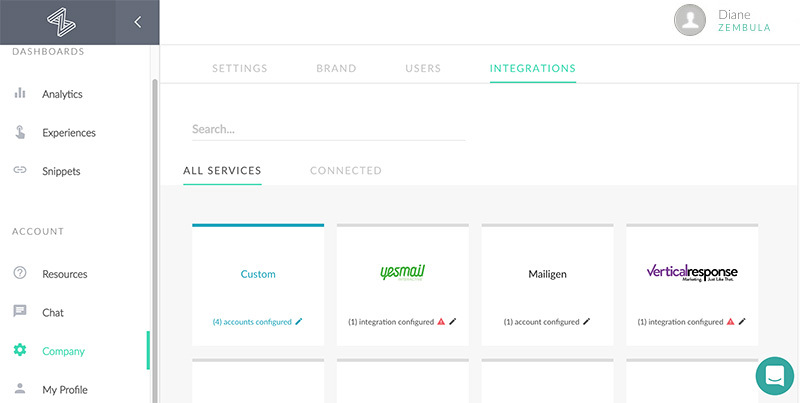 Navigate to the Mailchimp logo, or type it in the search box at the top. Once you have located it, click the Connect button. You will be taken to a screen where you can add your Mailchimp account. All Mailchimp accounts and forms will be listed here as you add them. Click Add Account at the upper right of the screen. A new browser tab will open where you will sign into your Mailchimp account. Once you have your Mailchimp account connected, you can use the forms in your Zembula experiences. Click here to learn how to set up your experiences to collect email addresses. *If you get an authentication error, you will need to reauthorize your account.